Anemia is a lower than normal amount of healthy red blood cells (RBCs). They’re made by the body in the bone marrow. RBCs have hemoglobin. 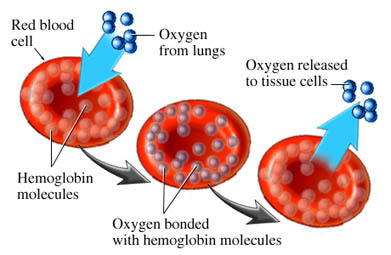 Hemoglobin picks up oxygen from your lungs and carries it to your cells all over the body. Your cells need oxygen so they can work like they’re supposed to. This lets them make energy and keep you alive. Hemoglobin also picks up some of the carbon dioxide given off by your cells. It’s returned to the lungs and breathed out. If your body doesn’t have enough healthy RBCs to do these jobs, it won’t work as well as it should. Any loss of blood will lower the amount of RBCs. If you are bleeding heavily, the loss will happen quickly. Serious problems, such as shock, may result. Bleeding from a stomach ulcer or colon cancer can also lead to anemia. Blood leaks slowly and you may not notice it. It becomes a problem if the blood loss happens faster than the body can make new blood cells. Iron, folic acid, and vitamin B12 are needed to make RBCs. These come from foods you eat. Low levels of these can affect how the bone marrow works. Cancers, certain medicines and toxins, allergic reactions to medicines, and long-term health problems can lead to bone marrow damage. This makes it harder for the body to make RBCs. Hereditary defects, such as sickle cell disease, also may lead to anemia. When the bone marrow doesn't work at all, it's called as aplastic anemia. RBCs last for 3-4 months. After this time, the body destroys them and recycles what it needs. The marrow may not be able to keep up with the demand for new red cells. This can happen if there is a problem with the blood cell or they’re recycled too fast. If this happens, they’re also more fragile and don't last as long. Normal RBCs can also be destroyed quickly by illnesses such as malaria or Rh incompatibility. What are the risk factors for anemia?What are the symptoms of anemia?How is anemia diagnosed?What are the treatments for anemia?Are there screening tests for anemia?How can I reduce my risk of anemia?What questions should I ask my doctor?Where can I get more information about anemia? Anemia. American Society of Hematology website. Available at: http://www.hematology.org/Patients/Anemia. Accessed October 12, 2018. Anemia. National Heart, Blood and Lung Institute website. Available at: https://www.nhlbi.nih.gov/health/health-topics/topics/anemia. Accessed October 12, 2018. Anemia—differential diagnosis. EBSCO DynaMed Plus website. Available at: http://www.dynamed.com/topics/dmp~AN~T240897/Anemia-differential-diagnosis. Updated January 21, 2016. Accessed October 12, 2018. Overview of decreased erythropoiesis. Merck Manual Professional Version website. Available at: https://www.merckmanuals.com/professional/hematology-and-oncology/anemias-caused-by-deficient-erythropoiesis/overview-of-decreased-erythropoiesis. Updated July 2018. Accessed October 12, 2018.